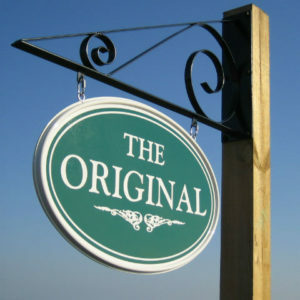 At Iron Design we have over 25 years of experience in the sign business, and in that time we have encountered the same sign design problems again and again. In our projecting sign range we overcome these problems and main limitations to using a projected sign, problems like small mounting area, low shop fascia, planning consent problems, a combined hanging basket bracket, low cost lighting and many more. The total surface area encompassed by each sign in this range has been designed to come within the limits laid out by most planning authorities, allowing for immediate permission free installation. 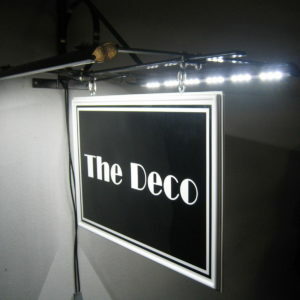 Our projecting sign range offers a complete package including panel and lighting, which can be delivered the next day and only requires addition of graphics and installation by the sign shop. This releases the sign shop from having to source a blacksmith etc. 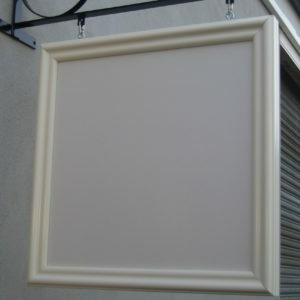 and having to manufacture a sign panel themselves, consequently greatly reducing cost and lead-time. Our designs are both traditional and contemporary, sympathetic for conservation areas and just as at home on the high street. The uniformity of design can also work well in shopping malls and arcades. We offer a reliable and professional service with full product range ex-stock. Payment for products can be made by credit card online or by phone. NB. For payment by cheque, items will be dispatched on cleared cheques only. Check out our new slim line LED trough lights in the lighting products department. Please feel free to enquire or fax us with any further enquires you may have.